Our Godly Play program is for children in Kindergarten through 5th grade. Godly Play is designed to respect the real and beautiful spiritual lives of children. It is not your typical Sunday School curriculum. It is designed to invite children into wonder about biblical stories, it is not interested in indoctrinating them. Using the power of story, children are invited into the rich and layered narratives of the people of God, Advent, the parables of Jesus, Easter, and even Quaker stories. The classroom and the children's time together is structured around the Montessori method. Materials are well made and accessible to all the children to work with. Following their time of listening to the story they are invited into wondering with their hands. This is their "response time" and it allows the children to interact with the story they just heard using art supplies and other materials. The children also enjoy a small snack together, and share their joys & concerns with one another before their parents pick them up. You can watch the video to the left to get a sense for what a Godly Play story sounds and looks like! Being a teenager is hard. They are doing the hard work of discovering themselves, their desires, and hopes for the future. They are doing this work in challenging environments, they may find themselves doing it alone, or with little support. 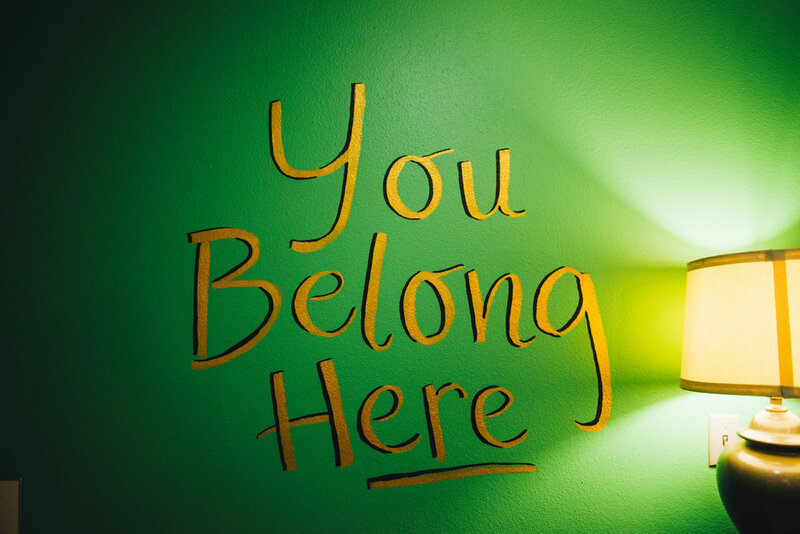 Our goal is to create a safe and welcoming space for adolescents of all types. We especially extend a welcome to teens in the LGBTQ community. Having a space to explore spirituality can be hard in Portland. Our goal is to enter into those conversations with care, and to explore the various ways we can do the important work of listening to our inward teacher. We often talk about Jesus, especially because we see the life and teachings of Jesus as pointing us towards a more compassionate world. We have two groups. One for middle schoolers and one for high schoolers. Typically, the high school group meets on the 1st and 3rd Wednesdays of the month, and the middle school on the 2nd and 4th. To find out more about youth group click the button below! This is painted on the wall of the youth room. We long to create safe spaces for everyone to be their truest selves. Mark Pratt-Russum joined our community in the summer of 2010, and has been leading the children and youth program’s at WHF ever since. Mark has two kids of his own, Kade and Lucia, and they live in NE Portland. Mark has found his home with Quakers, appreciating the contemplative, slow, and intentional style of worship. During his studies at Eastern University he found himself focusing on the potential for leading young people in contemplative practices. He deeply appreciates the wonder-filled approach to the Godly Play program for the children, recognizing the importance of building in mystery and play into our spirituality. He takes the same approach with the teenagers he works with at West Hills. The group of teenagers that gather during the week mostly don’t identify as Christians, but nevertheless Mark creates space for conversations about matters of the heart, compassionate action in the world, and listening deeply to the inward light and teacher, even if we do not assign Christian language to those things. Mark sees in the life and teachings of Jesus a radical, and counter-cultural opportunity to infuse the world with love. You can find more information about Mark using the social media links below!